* Application with Polyester Substance in its Surface. * Reflector: High Purity Aluminum or Stainless Steel SS304,Mirror Polish. * Fastener Bolt and Screws: Stainless Steel, Anti-theft screw. -Workmanship for 5 years,90% of minimum power output over 12 years,80% over 20 years. * Gelled battery, Sealed Type.Â Deep Cycle. Maintenance Free. * Intellectual Control Technology Based On MCU And Special Software. * Adopt Tandem PWM Charge Control Method, So That The Voltage Loss Of Electrical Circuit Is Only The Half Of Â Diode Charge, Charge Efficiency To Improve By 3% - 6%. * The Over Discharging Recovery Control And Automatically Floating Charge Control Can Prolong The Battery Service Life. * Battery Reverse Connection Protection, Over-voltage Protection And Under-voltage Protection. * Solar Module Reverse Connection Protection. * High-precision Voltage Control For The Battery Safety Work. * Green Energy,Low Power Consumptiom,Save 60%~80% Than Others. * Higher Power,Higher Brightness Intensity,Good Color Rendition. * Save Electricity Cost,Save Electric Transformer And Cable Cost,Free Maintanenance. 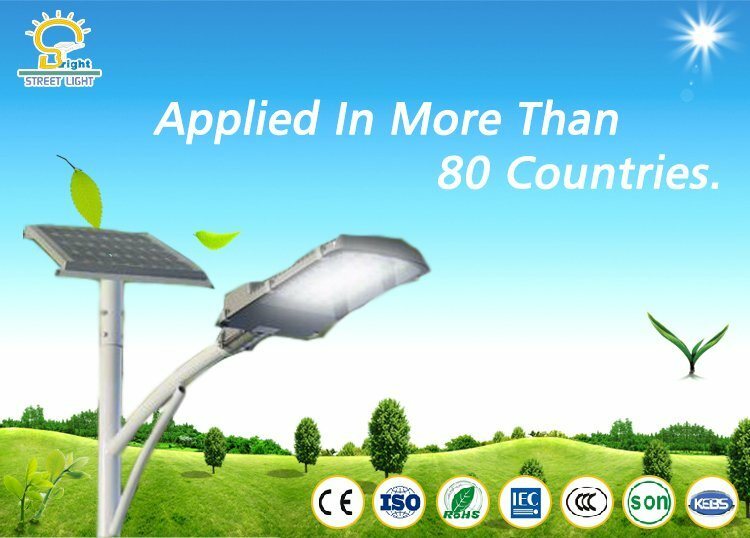 * Environmental Impact---Eliminate Hazardous Disposal,Low Light Pollution,No Radiation. * Longer Lifetime: Between 80000-100000 Hrs,If Lighting 12Hrs/Night Could Use At Least 12-22 Years. * Less Heat Generated Compared To Other Sourses. * Downward Orientation Of Light Could Adjust Lighting Angles And Lighting Range And Shape On The Ground To Â Â Â Meet The Road-rectangular,Other Lighting Source Just Could Give Common Round Shape And Small Lighting Â Â Â Â Range. Delivery Time 15-20 Working Days After Receiving Down Payment For One Container.